Kansas City is said to have over 100 restaurants, joints, shacks, stands, trucks and other outlets that specialize in barbecue. And most of the places serve barbecue that’s smokin, making it it the pits for tourists fired up to find the hottest to decide where to go. That’s when supergal Bethanie Schemel comes to the rescue. We call Bethanie “supergal” because she not only moms two kids (a new baby and a toddler), but also runs a popular business with her firefighter husband, Karl. 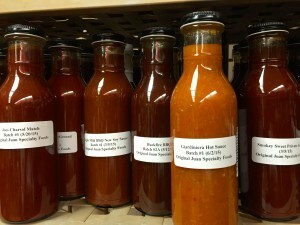 Timing allows the tours to stop at four restaurants plus the fascinating Original Juan Speciality Foods—a company that bottles BBQ sauces, rubs and seasonings for a large number of KC BBQ outlets. 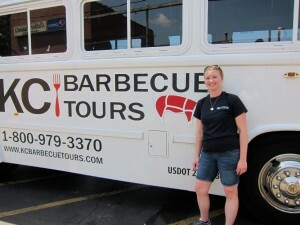 Because the tours offer visitors an in-depth, insider introduction to KC’s barbecue scene and are not only super informative, but also throughly enjoyable, we say they are a must, but just in case visitors want more, we grilled Bethanie about where they should go. Kansas City has been serving up smoked meats for well over 100 years and pit masters around the city have spent that time perfecting their craft. Once known as the “poor man’s food” only being served out as a way to keep families fed during the late 1800’s, Kansas City barbecue has grown to the point where a barbecue restaurant can be found every few miles. With over 100 barbecue restaurants dotted throughout the Kansas City area, Kansas City has earned the title of “The Barbecue Capital of the World”. 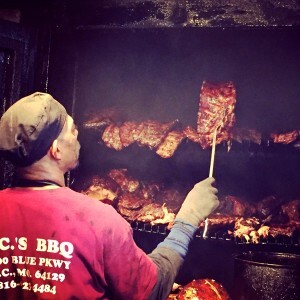 Take a step inside LC’s and you will find an old fashioned barbecue joint, where the smoker sits right behind the small counter and every order is called out to be made on the spot. 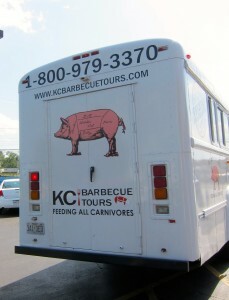 Their hickory smoked meats and sweet sauce have Kansas City locals lining up on a daily basis. The secret to LC’s is to know what you want before you step to the counter. My recommendation is the brisket, ribs or burnt ends with either fries or beans to go on the side. Arthur Bryant’s is, perhaps, the city’s most historic, iconic and well-respected barbecue restaurant. 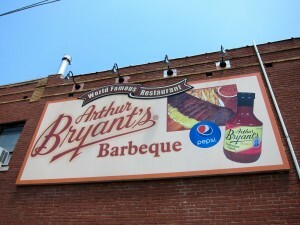 Holding true to traditional Kansas City smoking methods of oak and hickory wood, Arthur Bryant’s is not only a popular spot for locals, but for celebrities, presidents and politicians. If you are going to walk through their historic doors, make sure to grab a slab of ribs or brisket sandwich with a side of beans, cole slaw or fries. Make sure to try some of their Original sauce to bring on a little extra flavorful history. Don’t let the loud “Hi, May I Help You” greeting as you walk in the door startle you as you look for which savory and traditional Kansas City oak and hickory smoked meats to try on their menu. 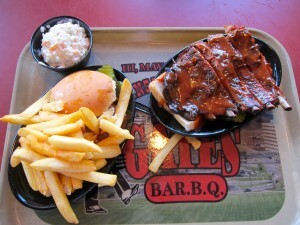 Gates and Son’s is another historic, iconic and well-respected barbecue must-try in Kansas City. 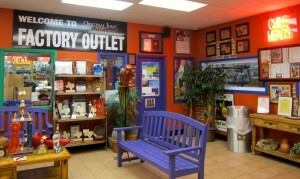 The atmosphere can be loud and classy at the same time, and the menu will give you many options. If you have a hard time choosing, you can’t wrong with one of their platters which serves out ribs, brisket and turkey slathered in their Classic barbecue sauce. 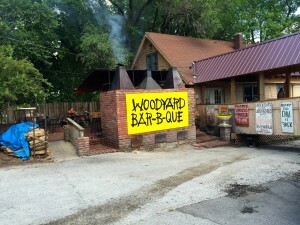 Set off the beaten path, Woodyard is a true hidden gem in Kansas City! It’s not just the down to earth atmosphere that will make you want to hang out on their patio, watch the Pit Master work his magic and enjoy a Boulevard brew, but their delicious meats smoked over pecan wood will make you want to hang out for just a little bit longer. If you get there early enough, order Woodyard’s chicken wings. 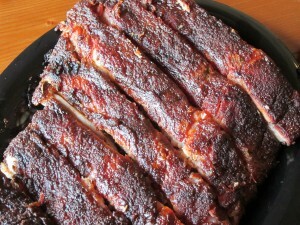 You can never go wrong with their baby back ribs, Frankenwurst (smoked sausage), or Carolina sandwich. Sides are an absolute must at Woodyard! Their cheesy corn, potato salad and coleslaw are made in house and are my top picks. It was the Father of Kansas City barbecue, Henry Perry, who once posted a sign stating “I’m here to serve you, not entertain you.” While this holds true in many Kansas City barbecue restaurants, BB’s is happy to serve and entertain you with live blues music six nights a week and hickory smoked meats fresh from a smoker. BB’s has ties to Kansas City’s famous Jazz district, so sit back, listen to the tunes, pop the top on a cold one and enjoy some amazing ribs, burnt ends along with battered fries. smoked meats in person. The burnt ends and thin sliced sausage with beans on the side (that can only be described as a taste adventure) are my top picks. 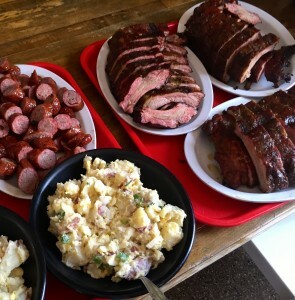 competition style barbecue, a stop in at Plowboys BBQ is a must. Plowboys won the title of Grand Champion from the 2009 American Royal Barbecue Competition, and you can get a taste of victory in any of their oak wood smoked meats (although ribs, burnt ends, brisket and their BBQ Nachos are the top four that please my palate). 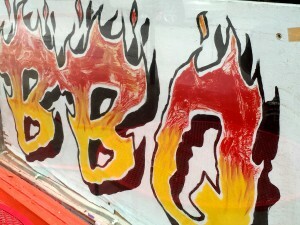 Get to SLAP’s early if you are wanting to try their nationally recognized barbecue. Coming in second place (only because of a coin toss) on the show Barbecue Pitmasters, this restaurant will make you want to keep going back for their ribs and cheesy potatoes.